"Welcome to Our Kampung, Kampung Daun"
Familiar greeting that welcomes you when entering the area of Kampung Daun Culture Gallery & Cafe. Indeed, the village atmosphere full of hospitality, quiet and feels homy here. the right choice for your visit. Here you will find a variety of unique characteristics and rural areas are still traditional but elegant. In the cafe you can see street vendors selling Lipet lunkhead, cotton candy, and sweet fragrance that sits on the edge of the walkway lined Kampung Daun. Not to forget the original local entertainment you can also enjoy here. Singers who play the harp and harp with fingers limber, from huts to the huts around. Really felt at home, is not it? 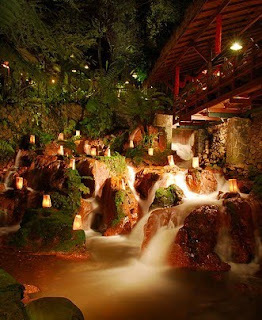 Kampung Daun is located in a small valley, the area attractions Cihideung, in the northern parts of the city of Bandung. Its location is situated 4.7 km from the mouth of Bajuri Sergeant Road, near junction Terminal Ledeng. Originally Villa Triniti built this place in 1997, which later transformed into a picnic area, where people are free to come as he took the mat and food. Natural places, picturesque and away from the bustle of the city makes Ruth Tamzil de Fernandes was inspired to make a simple hut for where to eat and unwind. This idea was further developed when Indonesia experienced much unrest, especially in big cities like Jakarta and surrounding areas. Ruth thought; why not just go back to the village? The place is so quiet and peaceful. Simple desire is then poured in a beautiful line of poetry. Kampung Daun name itself is taken because in this place previously filled with squash leaves. Philosophy is more lush squash the duck. 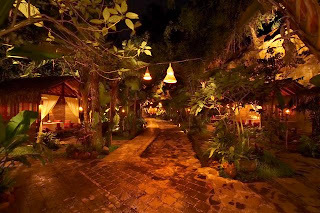 So, Kampung Daun village that is low profile and earthy. Squash leaf-was used as a symbol of Kampung Daun. Beginning in 1999 built four huts with surabi and poffertjes as the food served. Over time, for the sake of huts built huts. Kampung Daun now has 29 small huts, 4 huts with a capacity of 30-50 people, Bumi Cai (above the water), RB (big house), 2AB waterfall (the waterfall waterfall A and B, where the direct view towards the waterfall) , Ageung Hall (a hall which was at the top) with a capacity of 200-300 people. This Ageung hall has its own story. Joglo Bale Ageung obtained from Solo, thought to have lived 300 years. There are four fundamental pillars (main mast) and each pillar there are 17th century VOC coins. You can choose where to eat according to taste. Can choose shack with wooden chairs or sitting on the floor. 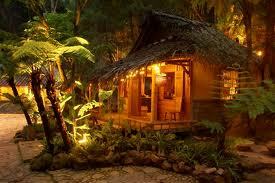 Or lean body with bolster pillows propped up, while enjoying the fresh air in an area of 1 hectare. If you want to enjoy the unique natural rock cliffs, waterfalls and feel the rush of fresh water, you can walk a bit into. There, you will see the hanging rock towering rock cliffs. Romantic atmosphere feels when moving evening. Along the entrance to Kampung Daun, you will be greeted with a colorful lanterns variety of forms. Torches are lit along the sides of the road making the trees appear as silhouettes of dancing with the wind. Kampung Daun not service in an elegant but casual. Waiters will serve you with the understated, polite and hospitality so that you will feel the family atmosphere in the village itself. Not only is a sense of concern, food decoration also a major concern. Various trinkets such as a plate of woven bamboo and fruit as a container of rice, whole ingredients rendered natural impression. Leaves hometown menu served more traditional menu. Do not forget to enjoy your favorite foods like timbel typical leaf village. The menu looks a little different. Cone-shaped rice and blended with spices typical. Or fried rice served in a tapir with coconut rice in the middle surrounded by side dishes. 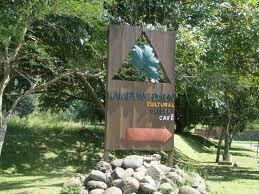 Cafe is open at 11:00 until 23:00, and weekend Kampung Daun closes at 24.00. 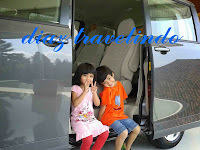 To be sure, there is one that could be worth more than Kampung Daun, the memorable experience they have. You can eat at a price as normal, but you will get an unforgettable experience with your family and loved ones.